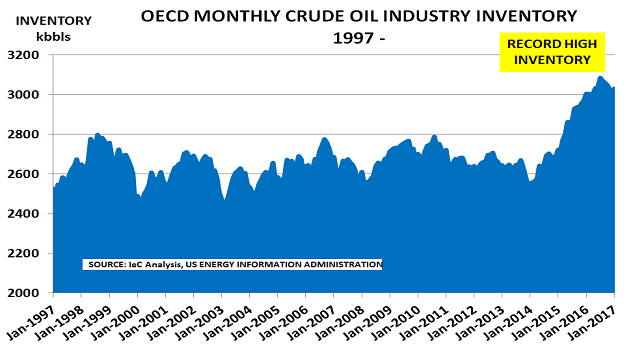 Oil markets have been at the centre of the recent myth that economic recovery was finally underway. The theory was that rising inflation, caused by rising oil prices, meant consumer demand was increasing. In turn, this meant that the central banks had finally achieved their aim of restoring economic growth via their zero interest rate policy. This theory was first undermined in 2014, when oil prices began their fall. There had never been a shortage of oil. Prices rose to $125/bbl simply because the hedge funds saw commodities like oil as a ‘store of value’ against the Federal Reserve’s policy of weakening the dollar. In reality, as I discussed last month, this final rally merely enabled new US production to be financed. 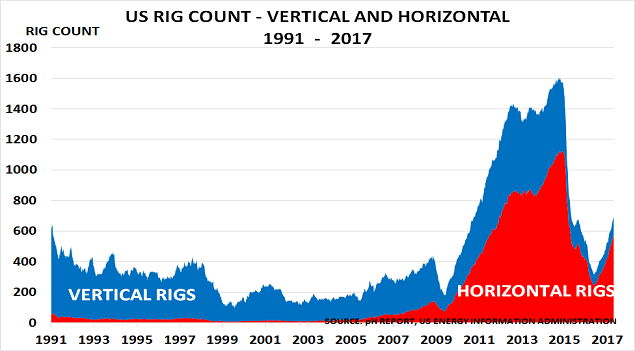 The US oil rig count has doubled over the past year, and each rig is now 3x more productive than in 2014. At the same time, the medium-term outlook for oil demand in the key transport sector is becoming more doubtful, with China and India both now moving towards Electric Vehicles as a way of reducing their high levels of air pollution. Already oil price targets, even amongst the optimists, are now being revised downwards. Nobody now talks about a “quick return” to $100/bbl, or even to $70/bbl. Instead the hope is that possibly they might return to $60/bbl at some point in the future – others merely hope that today’s $50/bbl level can be maintained. Hope, however, is not a strategy. And in the absence of major geopolitical disruption, it seems likely that the hedge funds will continue to withdraw from the market and leave supply/demand fundamentals to once again set the price. In turn, this will challenge the reflation and recovery myth that grew up whilst the funds were boosting their bets on the oil and commodity markets. As the second chart shows, inflation has already begun to weaken in China as well as in the US and Eurozone economies. China’s move away from stimulus will help to accelerate this move in H2, In turn, markets will likely return to worrying about deflation once more. Japan is an excellent indicator of this development. Its inflation rate completely failed to take off despite the major rise in oil and other commodity prices. As I have long argued, Japan’s ageing population means that its previous demographic dividend has now been replaced by a demographic and demand deficit. The US and Eurozone economies are both going through the same process. 10k Americans and 18k Europeans have been retiring every day since 2011 as the BabyBoomer generation reaches the age of 65. They already own most of what they need, and their incomes generally suffer a major hit as they leave the workforce. Companies and investors therefore need to prepare for a difficult H2. The failure of the latest oil price rally, and the return of deflation worries, will puncture the myth that reflation and economic recovery are finally underway. Political stalemate will increase, until policymakers finally accept that demographics, not central banks, drive demand. Then the investment banks had their day in the sun, raising $19.8bn in Q1 for private equity players anxious to bet on the idea that prices had stabilised at $50/bbl for US shale oil production. This was 3 times the amount raised in Q1 last year, when the price was recovering from its $27/bbl low. There was only one flaw in the story – the rebalancing never happened. As the chart shows, OECD inventories are now heading back to their previous record highs, having risen 38.5mb since January’s OPEC deal began. As always, most countries failed to follow through on their commitments – non-OPEC compliance was just 66% in March, and Russia is still producing 50kpd more than its quota this month. US inventories have also continued to rise, hitting all-time peaks, as the second chart confirms. Stocks would be even higher if US crude oil exports hadn’t surged by 90% versus last year to reach 706bpd this month. This is hardly surprising. Major cost-cutting over the past 3 years means that a company such as ExxonMobil now has an average cash operating cost of less than $10/bbl. US producers have been laughing all the way to the bank, as the third chart confirms, showing the recovery in the US drilling rig count. Not only have they been able to hedge their output into 2019 at today’s artificially high prices. But they have also been able to ramp up their use of modern, highly efficient horizontal rigs. These now dominate drilling activity, and are a record 84% of the total in use – reversing the ratio seen before shale arrived. Unless geopolitical events intervene, it is therefore hard to see how the myth that the oil market is now rebalancing can be sustained for much longer. “Hedge funds cut their bullish bets on oil by the largest amount on record in the week to March 14, according to the latest data published by regulators and exchanges. Hedge funds and other money managers cut their combined net long position in the three main futures and options contracts linked to Brent and WTI by a record 153 million barrels in just seven days. The reduction in the net long position coincided with the sharp fall in oil prices, which started on March 8 and continued through March 14. “The value of long positions for Brent and West Texas Intermediate crude, the global and U.S. benchmarks, reached a combined $56 billion on Feb. 23“. $56bn is an awful lot of oil to have to try and sell in a falling market. And of course, the hedge funds are well behind savvy traders such as Vitol and TOTAL, who have been selling their barrels of stored oil for some time. Already, WTI prices are back at the $48/bbl level seen at the end of November, before the rally began. Equally important is that the contango in the futures market has collapsed – with prices for May 2018 now just $0.30/bbl higher than for May this year. $0.30c/bbl won’t pay insurance and storage costs for a year, so all that stored oil will now have to be sold, as quickly as possible. The funds, and many observers, have simply failed to recognise that the structure of the US shale oil market has completely changed in the past 2 years. As I discussed 18 months ago under the heading, Oil price forecasts based on myths, not proper analysis, each well no longer has to be redrilled every few months, . Unsurprisingly, major oil producers are heavily invested in the field, with ExxonMobil having just spent $5.6bn to buy 3.4bn bbls of oil equivalent reserves. 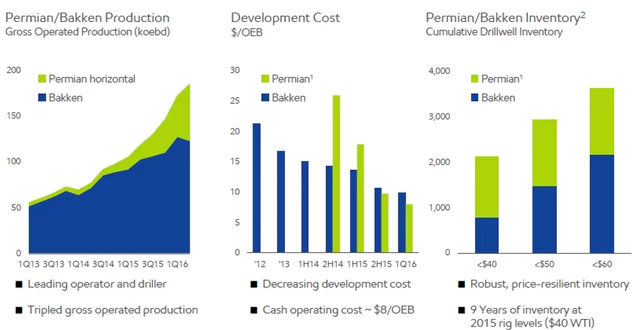 As the Forbes chart shows, EM’s cash operating cost was already less than $10/bbl last year. And EM now plans to more than double its rigs in the Basin to 25 after the investment closes. Of course geopolitical events, such as a US bombing of N Korea, could change these dynamics overnight. But anyone still gambling on higher oil prices and a rapid rebalancing of the market, probably has a very nasty shock ahead of them. The simple fact is that not only are US inventories at near-record levels but, as the top chart shows, the US is now also exporting 5mbd of crude and oil products – and this volume is rising month by month. It would be no surprise at all, if prices fell back to their median level since 1861 of $23/bbl in the next few months. And they might have to go even lower, temporarily, as many producers happily hedged themselves at $50/bbl for the rest of this year, when the speculative bubble was at its height. There were only two winners from the past 3 months of OPEC’s “Will they?, Won’t they?” debate on output cutbacks. Iran wasn’t one of them – although the talks did emphasise its renewed ability to control the OPEC agenda. Nor was Saudi Arabia, forced to accept the lion’s share of the proposed cutbacks. Instead, the US shale producers were big winners, with some saying they were “dancing in the streets of Houston” when the “deal” was announced last week. Who can blame them, given that production costs according to Pioneer now range between $2.15/bbl – $12.27/bbl in the vast Permian Basin field. 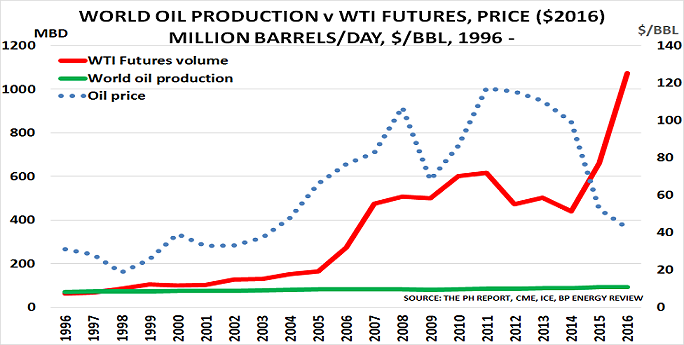 And, of course, last week was no exception in highlighting the dominance of the futures market is setting oil prices. As the chart above shows, their trading volume has rocketed since the central banks began their stimulus programmes. It averages nearly 12x physical volume so far this year, versus just 3x in 2006 – and just 1x in 1996. Unsurprisingly, most of the selling was being done by producers, delighted at being able to hedge their output into 2019. They sold so much, the forward curve moved from being in contango (where tomorrow’s price is higher than today’s), to backwardation (where tomorrow’s price is lower than today’s). This confirms that analyst talk of shortages and cutbacks is pure wishful thinking. Even more worrying for the oil bulls is that the rise in the US$ is also reducing demand in the major Emerging Markets. Oil is priced in US$, and this has risen by 10% or more against many currencies in the past few months. And any recession in 2017, which seems likely based on the chemical industry outlook, will further weaken demand. But the OPEC meeting did highlight one critical development. For the first time since the 1980s, Saudi Arabia sided with OPEC in terms of agreeing cutbacks. This has only happened twice before in history – during the 1973/4 Arab Oil Boycott, and the 1979/85 Oil Crisis. 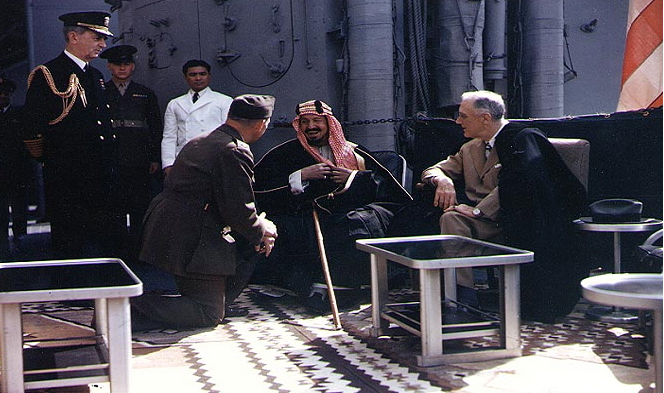  ”Suddenly the Saudis face a critical question – does the US still need the 1.3 million barrels/day they supplied in 2013?  And if not, will the US still be prepared to defend Saudi from attack, as it did during the first Gulf War in 1990-1991? This the New Normal world in action. Old certainties are disappearing, and we do not yet know what will replace them. Both the US and Iran are likely to be moving oil into world markets early in the New Year. The lifting of the US export ban has led to early announcements of oil sales: Vitol will move the first cargo via the Enterprise terminal in Houston in early January. Iran is expecting to have sanctions lifted around the same time, and is already ramping up production. While the Libyan peace deal implies its volumes should increase again. Commentators assured their clients that the US was unlikely to export much, if any, oil if the export ban was lifted. But this defied common sense. Why would the industry spend so much time and effort to achieve the lifting of the ban, if not to use it? And why would the Republican Party make this a centre-piece of policy, just before a Presidential election year, if it was not going to have any impact? This highlights how the waves of central bank created liquidity have destroyed the role of real analysis. Research reports used to be short and concise, and focused on improving their clients’ understanding of critical issues; today, they can be hundreds of pages long, but are instead devoted to measuring alternative performance between companies, sectors and asset classes. No wonder many people feel confused and uncertain as to what they should believe. The question of course is where all this new oil will go? Q1 is normally a period of strong demand from a seasonal viewpoint, so that should help. But pricing will be a different issue. US and Iranian crude will essentially be competing in the Asian market. And this is still slowing as China prepares for a difficult 2016. President Xi has signalled that he intends to “take the pain of restructuring” next year, with major supply side reforms including capacity closures. This makes perfect sense for him, as it means he will then be able to approach reappointment in 2017 with the argument that “the worst is now behind us”. But it means China’s economy will slow further, putting even greater pressure on commodity exporters and pricing. Financial players have become convinced in recent months that the oil price will rise. And so far, this has been a self-fulfilling prophecy. Their buying has led to oil being stored all over the world – in tankers floating at sea and in shale oil wells, as well as in storage tanks. Unsurprisingly, prices have rallied as all this product was being taken off the market. But whilst it easy to buy oil in an over-supplied market, the buyers now face the more difficult task of trying to resell it at a profit as we move into the seasonally weaker months of Q3. The chart above from the Wall Street Journal shows how the volume of oil in floating storage more than trebled between January – May, and is still more than twice the earlier level. The volume comes from traders taking advantage of the difference between current and future prices (the contango) to buy today and sell to hedge funds and other financial buyers at a guaranteed profit in the future. 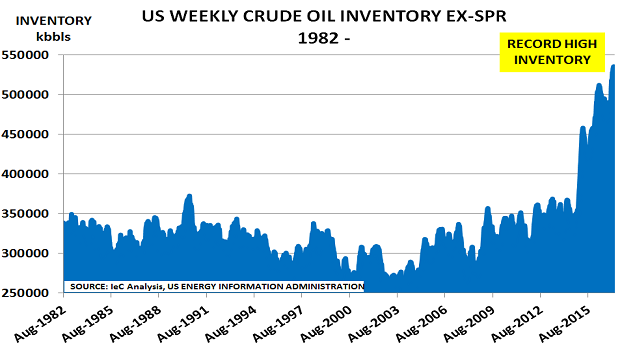 In addition, of course, there is the record volume of oil inventory in the US, as I discussed last week. Plus US shale producers have drilled 3000 wells in preparation to pump up to 1.3mbbls/day of oil once prices have moved higher. And in Europe, as the second WSJ chart shows, oil storage has hit a record level of 61mbbls. And finally, recent months have seen strong buying by China to fill its strategic petroleum reserve. It had decided to raise the reserve to 100 days of normal demand. But as a Sinopec executive told Reuters back in March this programme will soon be complete. It clearly makes no sense for prices to rise on such artificial/temporary types of demand, when the International Energy Agency suggests surplus production is currently running at 2mb/day. The problem is the record amounts of money that have gone into commodity hedge funds. This has fallen slightly from the $80bn peak seen in 2013, but still stands at $69bn today. And, of course, $69bn buys a lot more oil today than it did when prices were at $100/bbl in 2013. These mounting surpluses are making life more and more difficult for producers in Europe and W Africa. As I noted last year, Nigeria has lost its entire export market to the US, worth 1.3mb/day, and is instead having to send its oil all the way to Asia. Now N Sea producers are facing the same problem, with tankers carrying the equivalent of a week’s consumption by the UK now heading to Asia instead. Of course, as the saying goes, “money talks”. So as long as financial players keep buying in financial markets, oil supplies will keep increasing. But unused oil can’t keep being held in storage forever. Eventually the fundamentals of supply/demand balances will cause prices to fall back to historical levels of $30/bbl or lower. We cannot know what might be the catalyst for this development. Perhaps it will be a panic over Greece, or an Iranian agreement, or something else entirely. But barring geopolitical upset, it is not a question of “if”, but of “when”.